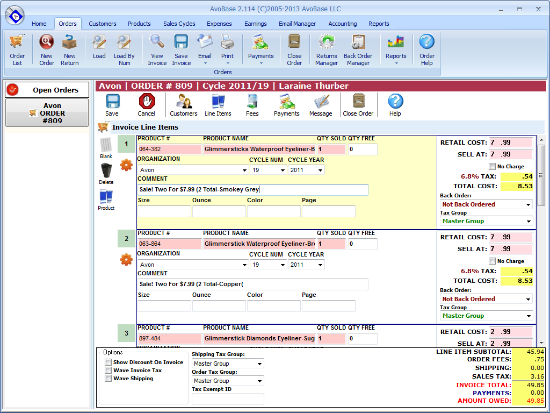 View Screen Shots For AvoBase, including Orders, Returns, Products, Customers, Receipts, Reports, Earnings and Expenses. Download AvoBase FREE and use it as long as you want. No expiration date. All features are active. Donate to current and future AvoBase development! Donate with Credit-Card OR PayPal Account! AvoBase comes fully loaded and ready to go to help you stop pushing paper - and easily and effectively run your Avon business. From Organizations, Sales Cycles, Orders, Customers, Products, Expenses, Earnings, Credits, Taxes and Reports - AvoBase helps you run your business properly. Let AvoBase help you sell your Avon Products. Define your own Campaigns, easily track your Orders, Expenses, Earnings and Taxes by any Campaign. Easily maintain Order Processing Fees. Easily keep track of Products with the same number but different Campaigns. Sales Organizations: Organization based, AvoBase allows you to sell from multiple Sales Organizations at the same time. You can sell Avon, Scentsy, Stampin-Up, Mary Kay - or all of them at the same time. AvoBase easily separates out all of your sales organizations with individualized reports. AvoBase can also help you run a very small business with a generic Sales Organization. No matter what you sell, AvoBase will help you sell your products, track Sales, Customers, Earnings, Expenses, Taxes - and most importantly - your Orders. Sales Cycles: AvoBase allows you to set as many sales cycles per year as needed. With Sales Cycles you can easily track your Orders, Expenses, Earnings and Taxes by any Sales Organization and Sales Cycle. Orders and Products are all tied to Sales Organizations and Sales Cycles. A generous plethora of reports for Earnings and Expenses are available. Customers: Your Customers are your greatest assets. With AvoBase you can track your best Customers, create Orders based on prior ordered Products, and email them receipts in PDF format. Track birthdays, keep notes and a whole lot more. Track Customer purchasing habits. Keep notes on Customer preferences. See all Order or Order Transactions at a glance. Products: Track your best selling Products and keep track of quantity on hand. Create specialized fields for your Invoices depending on your Sales Organization (size, ounce, scent, page and more). Keep track of your Sales Samples. You can even start using AvoBase without any Products immediately creating Orders while adding Products as you go. Products can instantly be moved from Invoices directly into your Product inventory. Easily track your top selling Products. Products already in Inventory can immediately be brought onto the Invoice Line Item simply by putting in the Product Number. Orders: Orders are the heart of AvoBase Orders and are all handled by Sales Cycle. You can easily take Orders or process Returns. You can take multiple payments in the form of cash, credit card, money order, debit card, check or even PayPal. With a full Sales Organization Fee Editor - you can easily add fees to your Order (such as Order Processing Charges and more) - and even have them set up to automatically add when new Orders are created. Payments can be taken from the Order list. AvoBase handles full payments and voided payments such as returned checks and non-sufficient funds. AvoBase comes with a full Back-Order Manager allowing you to easily handle any back ordered Products. Process returns easily on existing Orders. An easy to navigate Return-Product Manager allowing you to return Products to OEM or re-stock them directly into your Product Inventory. With customizable Invoices you can Email your Order or Return directly to your customer in full Adobe PDF format or even save them anywhere. Taxes: AvoBase has multiple Tax Groups with Tax Rates within them. Singular and Compound taxes are both supported. You can create an infinite number of Tax Groups with Tax Rates - and associate each Product, Order, Fee and Shipping with a Tax Group. This allows you to easily sell one Product at one Tax Rate - and another Product at a different Tax Rate. Using AvoBase in Canada? GST, PST and HST are all supported. Currency: AvoBase supports United States, Canada and United Kingdom currency rates. Shipping: AvoBase supports full shipping rates all tied to your Sales Organization. This way you can have multiple kinds of shipping rates. AvoBase Shipping rates are supported in both fixed rate and percentage - all tied to designated amounts. Do you need to charge $5 dollars for Invoice amounts between $1 and $49.99 - OR - charge 10% for any amount above $49.99? AvoBase does them all with ease. Expenses: Track all of your Expenses with the ability to tie them to Sales Cycles. Create your own Expense Types with Tax Deduction included. Easily create new Expense Lists with Expense Types automatically brought over to be filled in. Get extensive reports on how much you are spending for a single or multiple Sales Cycles. Print reports showing all items that are Tax-Deductible. Earnings Vs. Expenses and more. Earnings: Track Earnings outside of your Order Sales. Create your own Earning Types. Easily create new Earning Lists with Earning Types automatically brought over to be filled in. Extensive reports on how much you are earning on both your Order Products and personal Earnings. Earnings Vs. Expenses and more. Reports: A wide plethora of reports and growing. Included reports - Customer List, Top Customers By Orders Placed, Top Customers By Order Amounts, Order Transaction History, Order History, Single Customer, Customer Labels, Sales Cycle By Organization, Order List, Order Labels, Order Product List, Back Order lists, Earning Types, Earnings By Sales Cycle, Expense Types, Expense By Sales Cycle, Expense Tax-deductible by Sales Cycle, Earnings VS Expenses By Sales Cycles, Single Product, Taxes Collected By Sales cycle, Voids, NSF By Sales Cycle, Returns By Sales Cycle, Transaction Log By Sales Cycle, Shipping Returned by Sales Cycle, Fees Returned By Sales Cycle, Fees Collected By Sales Cycle, Shipping Collected By Sales cycle, Return Product Lists - and more on the way. AvoBase is a light weight Point of Sale Management Software Tool designed to help Avon representatives. In addition, AvoBase can sell from ANY Sales Organizations. * Avon, Scentsy, Mary-Kay and Stampin-Up! are copyrighted by their respective owners.